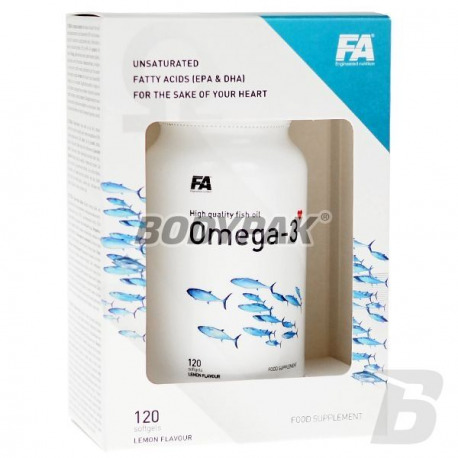 Health & BeautyFA Nutrition Omega 3 - 120 kaps. High-quality fish oil which is a rich source of essential fatty acids omega-3 salutary impact on your health. Help your body at least closer to longevity! In our market there are many products that omega-3 borders on measurement error - the doses are very low (almost insignificant). Omega-3 FA breaks the standards and contains a high dose of omega-3 has in one portion! 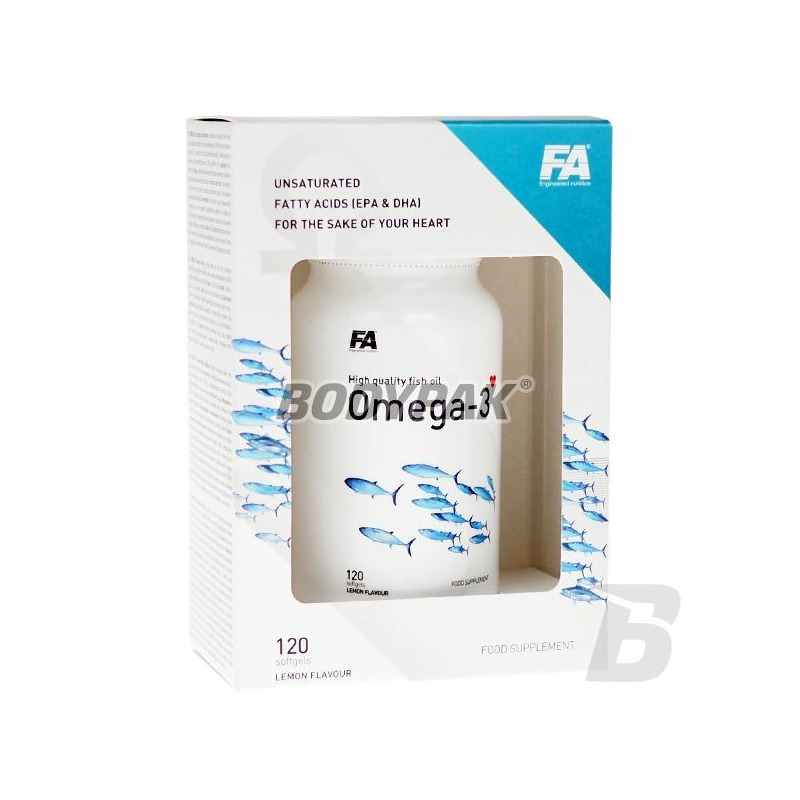 FA Omega-3 is a supplement containing a concentrated source of mono- and polyunsaturated fatty acids, which are actively involved in many procach life of every human being. Products of their metabolism, so-called. eicosanoids, prevent damage to blood vessels, reduce blood clotting and improve the transport of oxygen and nutrients in the bloodstream. The result is a faster oxygenation and nutrition of muscle cells. FA Omega-3 in the optimal doses are an indispensable component of proper diet every human being. Its properties allow you to maintain optimal health and fitness and psychophysical condition. Physically active people use omega-3 every day and recommend it as a basic nutrient allows for faster build lean muscle mass, effectively reducing subcutaneous fat and increase strength and endurance of the body. - Operate antiatherogenic and antithrombotic. - Improve the functioning of the brain and nervous system. - They are an important component of the highly active tissues in the cerebral cortex and retina. - Docosahexaenoic acid (DHA) helps to maintain the proper functioning of the brain and maintaining normal vision. Fats from fish are an important element of the supply of the human body in fatty acids omega-3. They are essential for maintaining physical and mental health. Regular delivery to the human body these important substances for health is essential, because they are involved in various metabolic processes occurring continuously in the human body. The main fatty acids of the omega-3 to EPA - eicosapentaenoic acid and DHA - docosahexaenoic acid. Due to the lack of the human enzyme systems capable of introducing double bonds in the 3-position of the n carbon chain fatty acids of the omega-3 can not be synthesized de novo. The human body is able to process fatty acids of vegetable origin of these biologically active substances, but in a very insignificant and insufficient. Therefore, the source of these fatty acids is adequate diet rich in oily fish, such as salmon, herring, anchovies and mackerel. In the case of diet-delivering the fish which is unfortunately deficiency, and consequently increases further the need for these nutrients in the form of dietary supplements such as FA® Engineered nutrition Omega-3. With the highest quality Omega-3 FA will be able to improve their health and improve their athletic performance. Składniki: Olej rybi dostarczający kwasy omega-3 (z sardeli), kapsułka (żelatynowa otoczka kapsułki, substancja wiążąca (glicerol)) woda oczyszczona, naturalny aromat cytrynowy. Potrzebuje uzupełnić braki Omega-3 w swojej diecie a ten produkt mi właśnie w tym pomaga - polecam!